“A Mentality Inherited from the Founders”? Charles Lee “a Damned Poltroon”? Lafayette in Lexington, 19 Nov.
Meeting Jane Mecom in Quincy, 18 Nov.
A Court martial has been held for several days upon Mess’rs Lovell, Leach and others, at which one Carpenter was sentenced to be hanged this day for carrying Intelligence over to the Provincials by swiming; however it was thought fit to reprieve him. Martial Law has had a full Swing for this month past. The Provost with his Band entering houses at his pleasure, stoping Gentlemen from enter:g their Warehouses and puting some under Guard: as also pulling down Fences, etc., particularly Mr. Carnes’s Rope Walk and our Pasture. The jailhouse diaries of Peter Edes, published in 1837, and John Leach, published in the New England Historical and Genealogical Register in 1865, have lots more detail about these proceedings. Which makes sense, since they were among the accused. 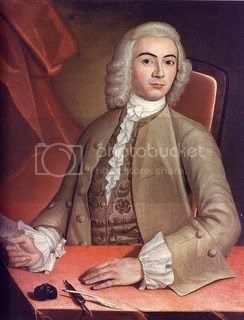 The royal authorities eventually figured out that the man who had corresponded with Dr. Joseph Warren before the Battle of Bunker Hill was James Lovell. They let Edes and Leach go, but kept Lovell locked up past the end of the siege. The “Provost” was William Cunningham, whose mythical end I discussed here. He and his sons had long careers as prison wardens in Britain after the war. I need to track down a book about prison reform in Gloucestershire for more information on them. Finally, Cheever mentions “Mr. Carnes’s Rope Walk.” This was Edward Carnes, and his house and rope factory was on the sparsely-settled side of Beacon Hill, under where Historic New England’s headquarters are now. In 1782 Carnes would marry Sarah Cheever, William’s 47-year-old aunt. Augst. 12. Fresh Provisions have been very scarce and high for some time past: Sheep selling at 6 or 8 Doll[ar]s: apiece, Ducks 2 Doll: a pair: Squabs 1 Dollar, Butter 1/4 doll:; Eggs 2 pistareens per doz: and other things in the like proportion. Provisions and Fuel have been extremely scarce and high for some Weeks past; Wood selling for £25 O.T. the Cord — Coal (Newcastle) £36 O.T. — Charcoal 50/ O. T. Sheep £3 sterl’g, Hogs at the rate of 1/6 sterl’g alive, Geese a Guinea per Pair; Fowls 5/ sterl’g a Piece, Cheese 1/ sterl’g lb, Butter 2/ sterl’g — every thing in like propor’n. Two items appear on both lists: sheep and butter. Cheever recorded the prices in different currencies, making the comparison a bit harder, but the standard ratio was one Spanish dollar to six British shillings. Thus, in August a sheep cost up to 48s., or £2.8s, while in November the “extremely…high” cost was £3. Butter was apparently a quarter-dollar, or 18 pence, per pound in August. (Cheever didn’t record the unit, so I’m guessing.) It was two shillings, or 24 pence, per pound in November. Evidently between those months it became harder to obtain butter, but no harder—maybe even easier—to obtain sheep. 15 [August]. This afternoon arrived a number of Transports that went about a fortnight since after Provisions etc: which it is said have brought from Gardiner’s & Fisher’s Island 1900 Sheep, 101 head of Cattle, 70 Hogs, some Cheese, Butter, Eggs, and Wood. The Transports were man’d with Refugees, Sailors & about 100 Soldiers. . . .
17. A quantity of Beef delivered out from the Market-house to the Inhabitants at 8d per lb. Sept. 4. A Vessell or so now and then drops in with Cattle, etc: bought a quarter of one to day which will make the first fresh Provision in the family since my Mamma, etc., went out. 5th. Cattle, Sheep, Hogs, etc., which were brought from Quebeck and N. Scotia have been selling two days past: out of which my Father bought two Oxen. Colonial Americans were used to seeing their food supply fluctuate over an annual cycle. Fresh vegetables were scarce in the winter, of course, but that season was the usual time to slaughter cows because the large carcasses lasted longer than in summer. The siege apparently disrupted the usual pattern inside Boston as the American army stopped food deliveries by land. The worst months for overall food supply, it appears, were in the middle of 1775. Word of the rebellion was just reaching London, so the government hadn’t had time to organize and send a resupply fleet. By autumn, cargo ships were arriving from Great Britain and other parts of the empire. In addition, as described in Cheever’s diary, the Royal Navy raided Long Island, New York, and elsewhere for livestock. Nov. 9. Several Companies were boated over to Phip’s Farm & brought off some Cattle at noon day under Cover of a Ship in the river, Cannon on Charlestown point, & their own Floats, etc; without any Loss. Early this month the Massachusetts Historical Society unveiled an online edition of William Cheever’s diary of the siege of Boston, May 1775 through March 1776. This document was published in the society’s Proceedings volumes in 1927, but now we can see images of the original pages plus a transcription. I’ll devote the next few days to this document. I arrived in Town from Charlestown at 1 oClo. after having seated & left my Mamma, Aunts & Sisters with Canterbury at Taunton on Acco’t of the distrest Situation of Boston. Cheever’s father had dined with the Sons of Liberty in 1769, so why did he and his son enter a town they knew was under military occupation by their enemies, and under siege from their friends? Well, the family property, including a warehouse of trade goods, was inside those siege lines. The Cheevers wanted to protect it. William Cheever was also a young man, born in 1752 and graduating from Harvard in 1771, so he probably thought he was up for the ordeal. Splitting up also worked on a longer scale: Loyalist families who left some members behind after March 1776 usually managed to keep ownership of their property. Families who left entirely usually lost theirs. On the other hand, riding out the siege inside Boston wasn’t easy. Old Sturbridge Village is hosting an exhibit of antique ice skates drawn from its own collection and those of Karen Cameron, co-founder of the Antique Ice Skate Club, and interpreter Rob Lyon. These artifacts will be on display from 3 December to 28 February. Here’s a museum article on the history of skating. In addition, when the weather permits, there will also be skating for all on the village’s outdoor rink, laid out on the museum village’s common. The Antique Ice Skate Club will meet there on 5 February. We used frequently to make skating parties to Jamaica Pond, about six miles from Boston. Major [Thomas] Musgrave of the 64th was by much the best skater at Boston, but before the winter was over I made great progress. 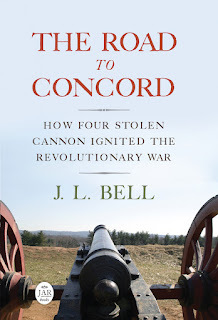 At Cambridge and all the towns the Yankees were constantly exercising [i.e., training for war], and became more and more insolent, so much so that the officers did not think it safe to go into the country near Boston. Notably, Maj. Musgrave helped lead an attack across the Boston harbor ice in February 1776. Back in June, I wrote about Elizabeth Royal, who shows up in the records of the Massachusetts Provincial Congress trying to get into besieged Boston with her child. The legislature understood she was “wife to William Royal, first sergeant in the 63d regiment of foot.” How, I wondered, had she become separated from her husband? And why was the Provincial Congress paying to send her to Newbury and maintain her there? Don N. Hagist of the British Soldiers, American Revolution blog has data on more redcoats than anyone I know, so it didn’t surprise me when he was able to answer some of those questions—while raising others. Don is today’s guest blogger, writing on the mysteries of Elizabeth Royal. I had heard of this woman before, but the version of the Committee of Safety entry reprinted in the Essex Institute Historical Collections, V. 46 (1910), has her name as Rogers rather than Royall. The muster rolls for the 63rd Regiment of Foot confirm that a man named William Royall was in fact in the regiment at this time; there was, however, no William Rogers. He is on the rolls prepared in Ireland which cover January to April 1775 and indicate that he was from either England or Scotland (the rolls distinguish British, covering England, Scotland and Wales, from Irish or Foreign). He continues to be carried on the rolls during the regiment’s service in America. Royall was not, however, a sergeant in the regiment as the Committee of Safety minutes indicate. He was a private soldier. The rolls have no information to suggest why he was separated from his wife. When British regiments sailed for America, shipping space was allocated for only 60 wives from each regiment. It is possible that Elizabeth Royall could not get space on a ship with the regiment; it is also possible that she was “big with child,” and her condition prevented her passage at that time. It is also possible that she was separated from the army after arriving in America. We also do not know whether she was able to make her way into Boston to be with her husband. Even if she was, they were not destined for a long and happy future. The muster rolls show that William Royall died on 6 October 1777; as is typical for these documents, no cause is given. The fate of his wife who dutifully tried to get to him in Boston remains unknown. Thanks, Don! For more information on women attached to the British army during the Revolution, here’s Don’s article on the subject. 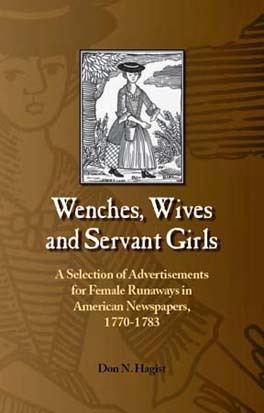 He’s also author of Wenches, Wives and Servant Girls: A Selection of Advertisements for Female Runaways in American Newspapers, 1770-1783, available from Ballindalloch Press. The bearer brings 1 1/2 busl. Malt for our Mama, and 3 buss. for Bror. Copley, which being good, will afford you a great deal of wholsome Liquor. Its now very find wholsome weather and a little Tour into the Country would promote any one’s health, especially the Sedentary Persons; I therefore strenuously recommend your keeping the approaching Thanksgiving with us, but take me right; I do not invite you to a sumptuous feast, but to good wholsome Country Fare with undissembled friendship. . . . I remain Yr. affecte Bror. That was before Thanksgiving in America settled in November, but the tradition of a big family meal was already established. For centuries, American politicians did not run up huge peacetime debts. It wasn’t because they were unpartisan or smarter or more virtuous. It was because they were constrained by a mentality inherited from the founders. According to this mentality, a big successful nation exists in a state of equilibrium between its many factions. This equilibrium is fragile because we are flawed and fallen creatures and can’t quite trust ourselves. So all of us, but especially members of the leadership class, should practice self-restraint. Moral anxiety restrained hubris (don’t think your side possesses the whole truth) and self-indulgence (debt corrupts character). As usual, Brooks was unable to name names while criticizing the American right, but able to do so while criticizing the American left. His column never mentions the last time the U.S. of A. was not adding to “huge peacetime debts” (the Clinton administration). In advocating a non-factional approach to problem-solving, it never mentions the last time a new President invited three members of the opposing party to join his Cabinet (Obama). Brooks’s presentation of history was equally selective. He described the founders’ stated ideal of “a state of equilibrium between [the nation’s] many factions” while ignoring how they quickly ended up practicing factional politics. Not only was the first generation of American politicians not above partisan strife, they weren’t above anathematizing their opponents. Brooks’s description of “a battlefield in which the people, who are pure and virtuous, do battle against the interests or the elites, who stand in the way of the people’s happiness,” fits perfectly with the Federalist-Jeffersonian battles. Only a month ago Reason TV uploaded a parody attack ad for the 1796 and 1800 campaigns using quotations from John Adams, Thomas Jefferson, and their adherents. As for Brooks’s attempt to tie that approach to politics to “huge peacetime debts,” let’s look at the level of federal debt from 1800 to 2000 (i.e., not including the last decade). The debt was lowest during Andrew Jackson’s administration, just before the Civil War, and in the 1910s. Were those all periods of bipartisan cooperation and respect? Not really. Federal debt went up as a percentage of G.D.P. during wartime, but also during peacetime economic downturns, including the Panics of 1837, 1873, and 1892, and the Depression of 1929. After the very large spike during World War 2, which ended with the U.S. relatively unscathed among major powers, the country paid down its debt steadily until the economic problems of the 1970s, then borrowed heavily in the 1980s. For more recent history, Wikipedia offers a helpful chart of the growth of U.S. debt, broken out by recent presidential terms. in fundamental agreement with each other. largely right on most major issues. remarkably in line with the author’s own views. On Sunday, the Guardian newspaper ran a story by Richard Holmes, author of The Age of Wonder, about “The Royal Society’s lost women scientists.” It highlighted several pre-twentieth-century British women who, Holmes said, contributed to scientific inquiry. The first example is Margaret Cavendish, the Duchess of Newcastle, who attended Royal Society meetings in the late 1600s. Back in college, I actually wrote a paper about one such session. As I recall now, Robert Hooke was supposed to do something awful to a dog to demonstrate its breathing, but so many members escorted the duchess out to her carriage halfway through the meeting that there wasn’t time. I don’t recall the duchess making a significant contribution to science, and Holmes doesn’t really describe one, as opposed to her contributions to philosophy and letters. Then again, I don’t recall such gentlemen at that meeting as John Evelyn doing much for science, either. Anna Barbauld, the brilliant young assistant to Joseph Priestley FRS, the great 18th-century chemist, noticed the distress of his laboratory animals as they were steadily deprived of air in glass vacuum jars, during the experiments in which he first discovered oxygen (1774). Accordingly, she wrote a poem in the voice of one of Priestley’s laboratory mice and stuck it in the bars of the mouse’s cage for Priestley to find the next morning. [Priestley] allowed his sons to use the block on which he kept his wig as a target for air-gun marksmanship. Like these boys, Anna Letitia was amused by the medley of books, papers, apparatus, and odds and ends that littered Priestley’s study; probably she also got to take a hand in his experiments. That seems like a slender basis for saying Barbauld was Priestley’s scientific colleague, as opposed to a smart and lively protégée in poetry, politics, chess, and other fields. There’s a big difference between being a magician’s assistant and being a volunteer from the audience assisting with a trick. Parcere subjectis, & debellare superbos. [To spare the lowly, and to overthrow the proud.] VIRGIL. The Author is concerned to find, that what was Intended as the petition of mercy against justice, has been construed as the plea of humanity against cruelty. She is certain that cruelty could never be apprehended from the Gentleman to whom this is addressed; and the poor animal would have suffered more as the victim of domestic œconomy, than of philosophical curiosity. By then it had become known that the mouse had been trapped “by Dr. Priestley for the sake of making experiments with different kinds of air.” Though Barbauld had written the mouse’s plea, she felt a stronger urge to defend Priestley. The slave quarters opened to the public in 1962, and since then, scholarship and archaeology have determined that the site should be configured with separate men’s and women’s rooms with built-in bunks to accommodate the dozens of men, women, and children who lived there in 1799. Reproduction clothing, tools, furniture, cookware, ceramics, toys, and personal accessories will outfit the space to emphasize the living conditions and experiences of enslaved people as skilled craftsmen, house slaves, and laborers on the Mansion House Farm. It’s not clear to me what the most recent changes are. The first archeological studies focused on the enslaved workers’ buildings date to the late 1980s. 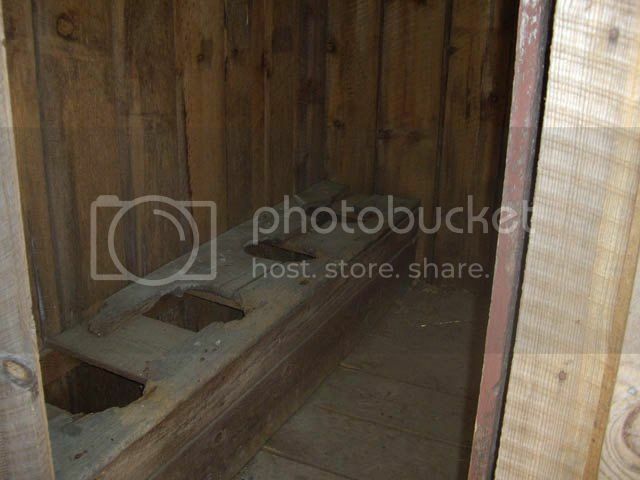 I don’t recall my own visit to Mount Vernon clearly, but the pre-refurbishment photos I can find online show the previous slave quarters already equipped with lots of bunks, as described here. The slaves living at the Mansion House farm were housed in communal quarters. A structure known as the House for Families was used until 1792, when it was replaced by the communal quarters in the Greenhouse complex. Archaeologists excavating the site 200 years later uncovered many objects, which helped us discover how slaves in the House for Families lived. Some slaves lived above their place of work, such as the kitchen or carpentry shop. Although we know a great deal about many of the slaves living on the estate, the records tell us very little about how the living spaces were assigned or who lived in each quarter. Perhaps the “Reproduction clothing, tools, furniture, cookware, ceramics, toys, and personal accessories” are the new details in this interpretation. In any event, it does indicate ongoing effort at Mount Vernon to present the lives of all the people who lived there. From the knowledge I have of your Excellency’s character, I must conclude that nothing but the misinformation of some very stupid, or misrepresentation of some very wicked person, could have occasioned your making use of so very singular expressions as you did on my coming up to the ground where you had taken post. They implied that I was guilty, either of disobedience of orders, want of conduct, or want of courage. Your Excellency will therefore infinitely oblige me, by letting me know on which of these three articles you ground your charge, that I may prepare for my justification, which I have the happiness to be confident I can do to the army, to the Congress, to America, and to the world in general. 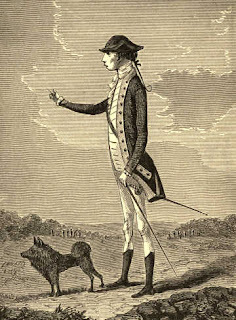 Decades later, the Marquis de la Fayette, who as a young officer had commanded troops in the battle, recalled that Washington had called Lee “a damned poltroon.” That would fit with Lee’s complaint about being accused of “want of courage.” No one at the time quoted Washington’s exact words, however. I am not conscious of having made use of any very singular expressions at the time of meeting you, as you intimate. What I recollect to have said was dictated by duty, and warranted by the occasion. As soon as circumstances will permit, you shall have an opportunity of justifying yourself to the army, to Congress, to America, and to the world in general, or of convincing them that you were guilty of a breach of orders, and of misbehaviour before the enemy, on the 28th instant, in not attacking them as you had been directed and in making an unnecessary, disorderly, and shameful retreat. Whatever the two generals had said, they were speaking in the heat of battle—and there was a lot of heat that June day. Nearly one hundred British and American soldiers died of “fatigue” or heat stroke. Two days later, though, neither man was backing down. One curiosity of the generals’ exchange is that Lee’s letter was dated 1 July, but Washington answered it on 30 June. Both generals acknowledged the first letter was misdated. Lee wrote a second letter apologizing for that error and dated that 28 June, the day of the battle. Some historians treat that as a misdated response to the correction in Washington’s answer—though it would be odd to write such an apology without ensuring it was dated correctly. I wonder about another possibility: Lee wrote his first letter right after the battle but dated it 1 July, thinking that he’d wait a couple of days before hitting send. But he sent it anyway, perhaps in the evening, then realized his dating mistake and sent along a preemptive apology for that. Washington might have received the first letter on 29 June and waited a day before replying. In their notes exchanged on 30 July, the generals agreed that it would be best to have a court-martial on Lee’s conduct. Because the court-martial included the charge that Lee had been rude and insubordinate in his letter to Washington, their written exchange became part of its record, and was widely reprinted in America and Britain. The testimony did not get into specifics of what Washington had said to Lee. Some late-1800s authors saw that as evidence that Washington didn’t use the words “damned poltroon.” However, it could just be evidence that Washington’s officers didn’t want to set down the specifics. That inquiry ended with Lee being relieved of command for a year. He spent 1779 sniping at Washington publicly, left the army for good in January 1780, and died less than three years later. Dawson cited that conversation without specifying how he came to know about it. Tompkins died in 1825. Dawson was born in Britain in 1821 and arrived in New York in 1834. So there must have been some intervening figures. Disconcerted and crushed under the tone and terrible appearance of his chief, General Lee could do nothing more than stammer, “Sir, sir?” When, with more vehemence, and with a still more indignant expression, the question was repeated. A hurried explanation was attempted—his troops had been misled by contradictory intelligence, his officers had disobeyed his orders, and he had not felt it his duty to oppose the whole force of the enemy with the detachment under his command. Farther remarks were made on both sides, and, closing the interview with calling General Lee “a damned poltroon,” the commander-in-chief hastened back to the high ground, between the meetinghouse and the bridge, where he formed the regiments of Colonels Shreve, Patton, Grayson, Livingston, Cilley, and Ogden, and the left wing under Lord Stirling. Some later authors insisted that it was completely out of character for Washington to swear like this, even once. But it’s clear that the commander said something unusually harsh to Lee. Tonight the Lexington Historical Society will host a talk by Alan R. Hoffman about the Marquis de la Fayette’s farewell tour of America in 1824-25. 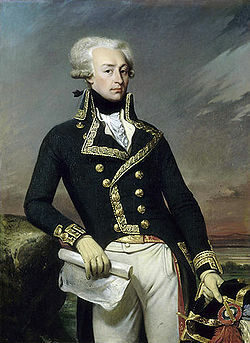 Lafayette had been the youngest of the Continental Army’s generals, and was among the last surviving leaders from the Revolutionary War. As a result, he was fêted in every state of the U.S. of A. Which provided a relief from political repression and, as I recall, money troubles back in France. This is not only a travelogue, but a series of sly political commentaries on what French readers were facing in France compared to what the young Republic in America was accomplishing, and how far the promise of the French Revolution had fallen short of the reality. The Common was tastefully decorated with flags, and a large concourse of people had assembled to do honor to one who had done so much for our country. Among those thus assembled were the children from the schools, and fourteen of the gallant men who had participated in the battle of the 19th of April, 1775. After entering the Common, under the arch before mentioned, the procession moved to the Monument, where the following patriotic and eloquent speech of welcome was delivered by Major Elias Phinney, of Lexington: . . . The next year, Phinney published his History of the Battle of Lexington, continuing his argument that his town common was where American militiamen first fired back at the British regulars. That provoked an oh-no-you-didn’t response in 1827 from the Rev. Ezra Ripley of Concord, with the happy result that more memories of men who were in the battle on 19 Apr 1775 got written down. Hoffman’s lecture will take place at the Lexington Depot starting at 8:00 P.M. It’s free and open to the public, and the historical society promises refreshments. And speaking of Thomas Jefferson’s descendants, earlier this month Search for Common Ground honored three members of that extended family with its 2010 Common Ground Award for “outstanding accomplishments in conflict resolution, negotiation, community and peace building.” Here’s the announcement, and here’s an interview with those descendants on the National Public Radio show Tell Me More. The people being honored are Shay Banks-Young, Julia Jefferson Westerinen, and David Works, founders of the Monticello Community. That group welcomes descendants of anyone born at Jefferson’s slave-labor plantation, free or enslaved, related to the President or not. Banks-Young and Westerinen trace their descent to Sally Hemings and Thomas Jefferson, and Works to Thomas and Martha Jefferson. In the N.P.R. interview, Works refers to Hemings descendants as his cousins. Meanwhile, Works’s older brother, John Works, Jr., started the Thomas Jefferson Heritage Society to “defend” their ancestor from that notion. In particular, he wanted to keep the Monticello Association from admitting Hemings descendants or letting them be buried in the graveyard the group owns. David disagreed with that vehement approach, and in 2002 ran for president of the Association, telling the Associated Press that he was a “moderate” on the paternity issue. At the 2002 annual meeting, the Deseret News reported, John Works, Jr., had to apologize for sending “a photograph of a black man with a zipper across his mouth” to another member who had publicly advocated for including the Hemings descendants. Nevertheless, the overall membership voted for David Works’s opponent and, influenced by the Heritage Society arguments, not to admit Hemings descendants. John Works, Jr., was quoted as insisting that people needed “D.N.A. evidence” to make a case for descent from Thomas Jefferson. Curiously, the association’s membership consists of people claiming descent from Martha Jefferson’s daughters with no genetic evidence at all. Soon afterward, David Works, Banks-Young, and Westerinen started the more inclusive Monticello Community, with its own meetings. But that wasn’t the end of the friction. In the spring of 2003 Works detected that one person in the group’s chat room, “Cassandra Mays-Lewis,” was posting from the same computer as the new head of the Monticello Association, Nat Abeles. Eventually Abeles’s wife Paula admitted that she had created the persona of a Hemings descendant to keep tabs on the other group. In 2004, John Works, Jr., told Time that his disagreement with his brother David had “fractured an already strained relationship.” Since then a lot has happened, and any rancor might have cooled a bit. But the Monticello Association continues to bar Hemings descendants from membership. When I first read about the Monticello Community a few years back, I wondered if this new group was a way to offer some sort of second-class membership to those Hemings descendants without actually acknowledging the strong evidence for their ancestry. Instead, the group appears to have become a catalyst and forum for exploring the members’ common heritage and the racial divisions in American society. Which is why its founders are being honored for seeking larger common ground. The latest issue of Colonial Williamsburg magazine, both in print and online, offers an article by James Breig titled “Hair’s Breadth: Locks Could Be Keys to Jefferson Mystery.” That “mystery” is the paternity of Sally Hemings’s children, but most working historians today don’t see that question as mysterious at all. Casual readers might believe the Jefferson-Hemings question was resolved in the affirmative in 1998, when a DNA study was done involving descendants of the Jefferson family and of Hemings. . . . the DNA evidence was shaky enough that it had to be bolstered by other data. That’s backwards. The documentary evidence of Thomas Jefferson’s paternity was already strong, and the D.N.A. provided extra evidence—more than we have for similar cases of the same age. As a result, most serious readers see the Jefferson-Hemings question as resolved to a high level of probability. Thomas Jefferson was the only Jefferson to have control over Sally Hemings, to be documented as near her each time she conceived, to let her children become free, to be identified by those children as their father, to be said by contemporaries to be their father, and so on. A smaller number of readers insist that other some other Jefferson(s) was more likely, but their arguments are unconvincing. I don’t see any indication that the author of this article, James Breig, has a scientific background. For twenty-five years he was editor of the Catholic Diocese of Albany’s official magazine, and he wrote a book titled The Emotional Jesus. It’s also not clear to me how much of the Jefferson-Hemings historiography he’s reviewed. The article cites online reports, but none of the books or scholarly articles on the matter. In writing, Breig was apparently unaware that Eugene Foster, the pathologist who led the 1998 study, died two years ago; the text refers to Foster in the present tense. If the owners of the hair gave permission to test the locks, and if the hair yielded DNA, two big ifs, conclusive proof, or disproof, of a Jefferson-Hemings union would be accessible. DNA is inherited half from the mother and half from the father. . . . In one generation, we expect to find half of the DNA in common between father and son. When there is more than one generation in distance, then the DNA in common is a smaller percentage, and it gets harder to make any clear conclusion. When looking farther distances in many generations, then the total DNA in common is much lower. So let’s imagine that at some future date scientists discover methods by which they can test the existing Thomas Jefferson hair samples for the appropriate Y chromosome markers. Curiously, the article doesn’t try that thought experiment and discuss the two possible results. Result 1: a match between Thomas Jefferson, patrilineal descendants of his uncle Field, and patrilineal descendants of Eston Hemings (who later took the name Eston Jefferson). Would that result offer “conclusive proof…of a Jefferson-Hemings union,” as the article claims? Not according to its own measure of significant doubt. Any doubters who are still alive would continue to insist that some other—any other—Jefferson male was a more likely father than Thomas. Result 2: no match between that hair and the patrilineal descendants of Field Jefferson and Eston Hemings. In that case, the simplest explanation is that the hair wasn’t actually Thomas Jefferson’s. But what if several separate hair samples with solid provenances all match? The next explanation would be that a Jefferson other than Thomas fathered Eston Hemings, and that Thomas himself was not actually the son of the man we believe to be his father. Or perhaps, moving down the ladder of likelihood, that Field Jefferson wasn’t actually the son of Thomas’s grandfather, or Field’s sons were both secretly fathered by another man, and that whoever left his Y chromosome in that Jefferson line also fathered a man in the Hemings line. All without leaving a clear trace in the documentary record. Genetic testing on Thomas Jefferson’s hair would point to his brother Randolph or his sons—the currently preferred candidates of the anyone-but-Thomas-Jefferson crowd—only if it also suggests that Thomas Jefferson was the product of an affair between his mother and unknown man. Not only would that probably be among the last things Jefferson’s self-appointed “defenders” would want, but it would also create a bigger “Jefferson Mystery” than we have now. All told, this article doesn’t strike me as adding much to the Jefferson-Hemings discussion. Any worthwhile historian or scientist would welcome more solid evidence, and revise his or her thinking based on it, so future genetic advances might conceivably be helpful. But this article suggests that we lack sufficient evidence about the Hemings children now, and that people shouldn’t acknowledge Thomas Jefferson’s likely paternity until science advances further. That seems like a petty way to justify keeping doubt alive. Mary Miley Theobald’s article “Lies My Docent Told Me,” about persistent myths in historical museums. Jack Lynch’s “Sold on Reasonable Terms,” about early American newspaper advertising, with lots of images and an additional slide show. What may be most revealing is usually left unspoken in the ads themselves. The language of marketing brings home, in a way statistics cannot, just how much slaves were viewed as commodities. Not only were enslaved people advertised alongside hairpins, teakettles, and candles; sometimes they appeared in the same ad. A slide show titled “Ninety Delightful Days and More,” showing Williamsburg’s sites in resplendent seasonal colors. 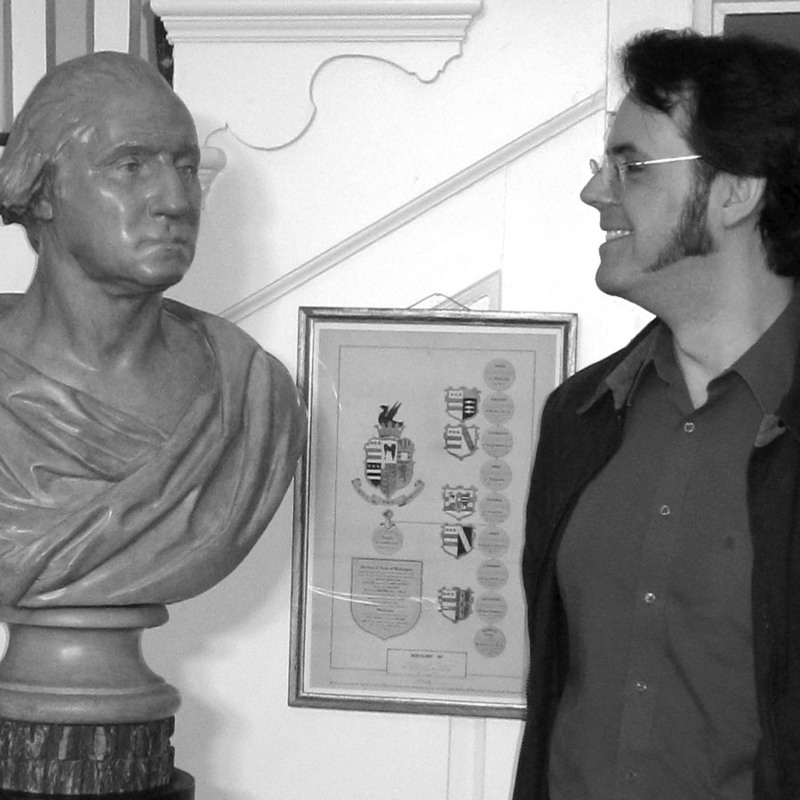 Ed Crews’s interview in character with Scott Green, the interpreter who plays Benedict Arnold. Andrew G. Gardner’s “Mumbo Jumbo Meets its Match,” on occult beliefs in the 1700s. American ships’ captains in the Atlantic appear to have caught on early to the steady northeast current along North America’s eastern coast and across to northern Europe. However, no one apparently mapped that whole current until the late 1760s, when Benjamin Franklin and his cousin, Nantucket captain Timothy Folger (shown here, courtesy of the Nantucket Historical Association), created and privately published the first chart of the Gulf Stream. That map can be explored at the Library of Congress website. 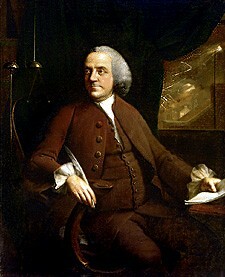 Franklin wanted to speed up mail delivery across the Atlantic by showing British captains how to avoid the current when sailing west. Apparently most captains ignored him. Coming home to America in 1775 in bureaucratic disgrace after leaking Gov. Thomas Hutchinson’s letters, Franklin apparently took his supply of printed maps with him; none survived in Britain. For two centuries that printing was thought to be entirely lost, but then a couple of examples turned up in French archives. Either French captains saw more potential in them, or Franklin brought a few copies when he arrived in France as an American diplomat. While in Paris, Franklin allowed another map to be engraved. Yesterday I described how the Norman B. Leventhal Map Center at the Boston Public Library discovered Franklin’s own copy in its collection. That map’s labels are in French, and they suggest the Gulf Stream points to France, not Britain—emphasizing natural ties between the new allies? On returning to the U.S. of A., Franklin commissioned yet another engraving of the Gulf Stream chart, this time published in Philadelphia by his American Philosophical Society in 1786. Here’s the Library of Congress’s image. This map’s inset shows all of western Europe equally, but this time the main map offers a lot more detail about the enticing Northwest Territory. Thus, though the Gulf Stream doesn’t change much from one of Franklin’s maps to another, the lands shown around it change significantly. Last month I had the pleasure of visiting the Norman B. Leventhal Map Center at the Boston Public Library. It’s gearing up for a major exhibition of Civil War cartography next spring, as well as its move into a permanent display space in the library’s McKim Building. Most of the maps the center’s staff had out on exhibit were from the Civil War, naturally. But one memorable item from the Revolutionary period was a bound volume containing just two engraved maps folded inside—probably why it had sat on the shelves unexamined for decades until curator Ronald Grim opened it. The two maps in that volume turned out to have come from Benjamin Franklin. He acquired them during his years in Europe. and a descendant gave them to the library. One is, according to my notes, a map of New England from 1755 dedicated to British bureaucrat and Massachusetts royal governor Thomas Pownall. The other is a French map showing the Gulf Stream, probably made with Franklin’s help. Because those maps are bound, I don’t think they can be flattened and scanned. (The image above is a detail of an earlier Gulf Stream map that Franklin created, used in a lesson module from Study of Place.) However, the Leventhal Center’s website has many other examples from its collection to explore online, including dozens of maps from the Revolutionary era. TOMORROW: Benjamin Franklin’s shifting Gulf Stream. Titled “Poor Richard’s Poor Jane,” Lepore’s lecture is based on her forthcoming biography of Benjamin Franklin and his sister, Jane Mecom. Lepore’s lecture is free and open to the public. On Wednesday night I spotted a poster about this lecture and two others, which were already past. Jane Mecom was also the subject of a biography by Carl Van Doren, published posthumously in 1950. It’s based mostly on the letters that she and Franklin exchanged, which Van Doren also published, and their letters with other family members. There’s been a lot of scholarship on women’s lives since that book, as well as a lot of cultural change, so I wouldn’t be surprised if Lepore has new insights to share. If my dear Brother would add to his superscriptions [i.e., addresses] of his letters “At the back of the North Church,” I might get them the readier. That’s another example of post-Revolutionary Bostonians using the term “North Church” to apply to Christ Church, as Paul Revere did in his 1798 account of his ride. Longfellow later called it “the old North Church,” which stuck. As long as I’m writing about schools in Revolutionary Boston, I must address what’s often the most pressing question for children about to enter a new school: Where do I go to the bathroom? [Selectman] John Andrews appointed to procure flaps for covering the Necessary at Master [James] Carters School, to allay to some measure the disagreable effluvia arising therefrom. The necessity of going out to the outhouse might have been one reason why in 1789 the town decided that girls shouldn’t go to school in the winter months. The boys had a recess of a few minutes to go out in the yard—eight at a time. No leave was asked in words; but there was a short club of a yard in length which was caught up by some boy, round whom those who wished to go out clustered, and were drilled down to eight. The club was then held up near Master’s nose, who nodded assent, when the eight vanished, club in hand. Upon their return there was a rush to seize the club which was placed by the door, and a new conscription of eight formed, and so toties quoties [as often as]. Nothing I’ve read about Boston’s colonial schoolteachers leads me to think they’d tolerate a “recess” in the way we use the term—which in this case would mean eight boys tearing around after each other in the schoolyard, right under the windows where the two teachers were trying to keep more than one or two hundred other boys focused on their lessons. The “few minutes,” the strict limit of eight, the “rush to seize the club” when the first group was done—all those details seem to fit if Otis was really talking about boys lining up to go to an eight-holer in the yard. Alas, no one wrote down a lot of details about this aspect of life. A writer in your paper of the 12th inst. [i.e., of this month] appears to be very angry that an attempt hath been made to discontinue the North Grammar School; and asks “who the men are the advocate the measure?” I answer they are men of property—men who pay large taxes in the town; and who have no benefit of the publick schools. I will now ask in my turn, why gentlemen should be so highly taxed to pay for the education of some people’s children; when if their fathers and mothers dressed less extravagantly, they would be able to pay for their children’s learning at private schools? We, in this town, may look for great advantages from our new Congressional Government: but until frugality and industry are more practised among all ranks, the complaint of bad times will continue. The children of the poor ought to be early inured to labor—in England and Holland, many people’s children earn their living at seven years of age, by being employed in some manufactory; but in this town little master is rigged up and sent to a grammar school, to learn latin for two or three years, or more—then to learn to write a fine hand, that he may at fourteen, be qualified for a merchant’s store, or a shop. Miss is sent to a dancing school, to be taught a polite behaviour, to the neglect of the necessary accomplishments for a good wife. These things are peculiar to the seaport towns, in this state; and one great cause of such general complaint of distressing times, in my opinion, is the great number of publick schools. It is the judgment of many, that if an experiment was made, by dropping all except one grammar and one writing school, just to answer the law—that in this town we should soon experience the salutary effects of such a measure; and it is to be hoped that the Gentlemen who now have the management of this matter, will make a trial, for one year only; and if it should not soon answer, they can easily put them upon the footing they now are. As I described yesterday, Bostonians did not adopt this proposal. The town voted to close the North Latin School, but it also chose to expand the schools for teaching reading and writing in English, and open them up to more children. Last week, in addition to speaking about Pope Night at the Boston Public Library and the Bostonian Society, I presented a paper on the public school system in Revolutionary Boston at the History of Education Society conference in Cambridge. The Boston schools are the oldest in the U.S. of A., sometimes said to be the seed for the whole nation’s education system. One history of the country’s oldest school, Boston Latin, even called it a “breeder of democracy” that helped bring on the American Revolution. In fact, before the Revolutionary War, Boston’s public education system was quite unequal and constricted. Schooling was available only to white boys, who entered either Writing Schools or Latin Schools, usually at the age of seven. I calculated that only about half of the white boys eligible for that service were actually using it. In 1770 the teachers at the two Latin Schools were paid two and a half times more per pupil than the teachers at the three Writing Schools. Two-thirds of all boys entering the South Latin School dropped out before finishing the course. The education there was entirely impractical unless one finished and went on to college; since families had to pay for private lessons in useful skills, the upper class got the most benefit from the free education. That system survived basically unchanged for decades. But the war started to shake things up, first by draining a lot of families from the town, and then by hitting the economy with shortages, restricted trade, and currency inflation. By the late 1780s, Bostonians saw a need to reform their education system. There was financial pressure from tax-paying property owners. There was ideological pressure to fulfill new republican ideals, which demanded an educated public ready to participate in governing themselves. And it looks like some folks worried that Boston’s school system was falling behind those of rural towns and perhaps other large seaports. Were the white boys not in the town schools being adequately educated? Should the town offer any public education for girls? The committee had no answers. But this was the first time those questions were raised. In 1789 the town meeting voted for some sweeping reforms. All white children would start attending Writing and Reading (English) Schools at around seven years old, spending half the day in each building. Girls would attend in separate classes from April to October because they couldn’t be expected to go out in the winter months (and perhaps because they could learn their lessons in only half the time). Rather than teach just handwriting and business arithmetic, the Writing and Reading School masters were charged to teach English grammar and composition and geography as well. After three years, some of their boys would go on to the town’s single Latin School while the rest of the children would continue with their Writing and Reading lessons. My paper concluded that the Boston school system had only a limited effect on the coming of the Revolution, but that post-Revolutionary republicanism had a great effect on the Boston schools. That was when the ideal of free education for all was really put into practice. TOMORROW: One Bostonian argues against the 1789 reforms. A week ago, I quoted a letter from the Boston Globe that offered a tongue-in-cheek derivation of the modern political term “Tea Party.” That prompted cheers, insults, and complaints about politics on this blog. More seriously, I want to address some issues raised by comments on that posting. First, when I consider Revolutionary history, that includes how we remember it and what principles it established. If a politician or political movement quotes, misquotes, or claims the mantle of the U.S. of A.’s founding, that catches my eye. If people invoke or break parts of the Constitution written in the 1700s, that’s relevant. Sometimes I see interesting parallels between events of the past and today. Still, all Boston 1775 postings pertain to the eighteenth century. I haven’t focused on income tax brackets, prohibition, charter schools, campaign finance, public media, or regulation of financial derivatives, and not because I have no opinions about those topics. Maybe a link will surface, and I’ll be interested. But there would have to be a link. Second, for Tea Party adherents to object to seeing ideas they dislike on a website they’re reading for free does nothing to dispel the notion that the movement’s emotional energy comes from privileged Americans whining about not getting everything they want. Instead, it looks a lot like evidence of people feeling entitled, unable to respond rationally, and not truly committed to their stated principles about freedoms. I understand that much of the American right has come to see the nation’s history, and especially the founding era, as their exclusive property. 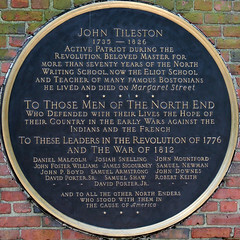 Some Boston 1775 visitors might therefore be surprised to discover that people with other politics, like myself, are just as passionate about it. But learning new things is why we research, right? Third and most important, I simply don’t agree with the idea that studying and discussing history can be segregated from politics. Especially when it comes to the Revolution and national founding, which is such an influential and emotionally freighted period. There’s a political dimension to writing about ordinary people’s experiences and desires instead of just those of elite politicians and military leaders. There’s a political dimension to writing about George Washington as a person who needed outhouses and chamber pots instead of just as a paragon. There’s a political dimension to writing about enslaved people, or working children, or Loyalists who lost the war. Simply sharing evidence that casts doubt on the legend of Declaration signer Richard Stockton has political implications today, as does highlighting how colonial Americans enjoyed burning the revered symbols of despised, suspected foreign religions. Even if I wanted to avoid modern resonance in discussing those topics, I couldn’t. Sometimes reader comments bring out the politics, as in my September posting about a museum in Virginia recognizing early Americans who came from West Africa. Most Boston 1775 postings touch on political principles and attitudes rather than specific debates today. But political matters are no more than one step away from practically any historical topic. It’s bound up in most research, especially when so many great resources depend on public funding: the Adams Family Papers at the Massachusetts Historical Society, the online Washington Papers at the Library of Congress, access to the Archive of Americana to Boston Public Library cardholders, &c.
As another example, one of my permanent links is to Gen. Washington’s Cambridge headquarters, now Longfellow National Historic Site. That house, maintained by the National Park Service, was once open for tours year round, but its current level of federal funding allows staff to welcome drop-in visitors five months of the year. Last year’s American Recovery and Reinvestment Act (a.k.a., “the stimulus”) sped up some long-delayed repairs. When incoming leaders of the House of Representatives talk about balancing the federal budget without higher taxes and without changes to defense programs or entitlements, they can fulfill those promises only with large cuts to agencies like the Park Service. Access to and maintenance of that historic site depends on decisions within our national political process. I see those connections floating behind each topic. I know Americans have a range of opinions about how to handle those issues. Rather than try to treat the Revolutionary past as somehow beyond political controversy, I prefer to express my political views sometimes, and recognize that there are other views I disagree with, sometimes strongly. That means occasionally being explicit about politics—because it’s unavoidably implicit the rest of the time. Some proud American authors credit Benjamin Franklin with the idea for daylight saving time (as well as, of course, nearly everything else not invented by Thomas Edison). I read that factoid a lot growing up. It’s based on a letter he sent anonymously to the Journal of Paris in 1784, when he was in France as an American diplomat. Every morning, as soon as the sun rises, let all the bells in every church be set ringing; and if that is not sufficient?, let cannon be fired in every street, to wake the sluggards effectually, and make them open their eyes to see their true interest. So would Dr. Franklin feel proud of how the U.S. of A. adopted the Daylight Saving Time system that just ended last weekend? Most likely, our timekeeping methods would take him a while to get used to. In Franklin’s era, the time of day was not standardized nationally. Noon was when the sun was straight overhead wherever you were; people knew noon was slightly different to the east or west, but there was no need for exactitude until railroads came along. Furthermore, Franklin wrote his letter as a joke. It was a satire on how Parisians stayed up late and slept late. It may also have been a gentle satire of himself, performing his role as the unpretentious American scientist concerned with efficiency and economy. It certainly was not a serious proposal to save 96 million livres. Salem Revisits Colonial Witchcraft, 18 Nov. and 16 Dec.
Now that Hallowe’en is past, Salem can turn to its real history of witchcraft—or, rather, to the real history of the witchcraft hysteria that began in Salem Village, now Danvers, and spread through Massachusetts. The Old Town Hall Lectures in Salem series has two upcoming presentations related to that 1692 scare and its repercussions. The Salem witch hunt has entered our vocabulary as the very essence of injustice. Judge Samuel Sewall presided at these trials, passing harsh judgment on the condemned. But five years later, he publicly recanted his guilty verdicts and begged for forgiveness. This extraordinary act was a turning point not only for Sewall but also for America’s nascent values and mores. In 1682, ten years before the infamous Salem witch trials, the town of Great Island, New Hampshire, was plagued by mysterious events: strange, demonic noises; unexplainable movement of objects; and hundreds of stones that rained upon a local tavern and appeared at random inside its walls. Town residents blamed what they called “Lithobolia” or “the stone-throwing devil.” In this lively account, Emerson Baker shows how witchcraft hysteria overtook one town and spawned copycat incidents elsewhere in New England, prefiguring the horrors of Salem. 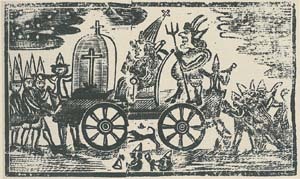 In the process, he illuminates a cross-section of colonial society and overturns many popular assumptions about witchcraft in the seventeenth century. America’s Revolutionary unrest started over seventy years after the Salem witch scare, about as long as it’s been for us since the Great Depression. But the specter of those events still lingered, as I discussed back here and here. And now it’s the basis of a tourist economy! Thursday I quoted from the Rev. Jeremy Belknap’s account of the Stamp Act protests in Portsmouth, New Hampshire. Here’s a more lively account from Charles Warren Brewster’s Rambles About Portsmouth, published in 1859. The London government appointed George Meserve, who was in England at the time, as stamp agent for New Hampshire. But he didn’t last long in office. on arriving at Boston on the 6th of September, (about seven weeks before the law was to take effect), the excited state of the public feeling induced him to resign his office of stamp master. But I would have you serve this nation. The effigies stood through the day, and in the evening they were carried about the town with much clamor, and then burnt. Making effigies of two men and the Devil and throwing them in a bonfire at the end of the day was how Portsmouth, and other New England seaports, traditionally celebrated the 5th of November, Pope Night. I don’t know why folks almost always hung two effigies, but they did. John Stuart, the third Earl of Bute, had been the tutor of George III, and served as First Minister in 1762-63. He brought the Seven Years’ War to a close, but lost favor with the British people and the king. Bute’s Tory politics made him an enemy to the Whigs, and his Scottish background made him an easy target. John Wilkes lambasted him with The North Briton, and John Horne accused him of having an affair with the king’s mother. American politicians blamed Bute for the Stamp Act of 1765 even though he had been out of office and favor for years when it passed. Carrying the commission around on a sword conveyed the symbolic message that the document was too foul to touch. Other processions of the time bore stamped paper at the end of long poles. After the repeal of the [Stamp] Act, and on the arrival of Secretary [Henry Seymour] Conway’s circular in 1766, enclosing a resolution of Parliament to the effect that the Colonies should make recompence to such persons as had suffered injury or damage in consequence of their assisting to execute the Act, Meserve applied to the Assembly of New Hampshire for compensation, which application was referred to a committee, who made a report adverse to his claim, and it was dismissed. Meserve ended up going with the British military to Halifax in 1776. This is the 5th of November, celebrated in colonial New England as Pope Night. So it’s time for my annual invitation to visit the “5th of November in Boston” website I made for the Bostonian Society a few years back. The site traces the history of the holiday, shows Pierre Eugene du Simitière’s sketches of the 1767 celebration, and describes how Pope Night dissolved and evolved during the Revolutionary War. Last Monday, the 6th Instant [i.e., of this month], at Night, some of the Pope’s Attendance had some Supper as well as Money given ’em at a House in Town, one of the Company happen’d to swallow a Silver Spoon with his Victuals, marked I H S. Whoever it was is desired to return it when it comes to Hand, or if offer’d to any Body for Sale, ’tis desired it may be stop’d, and Notice given to the Printer. This is one of the earliest printed records of Pope Night in Boston, and already the celebration was getting a bad reputation. However, the celebrants were pious enough to postpone their revelry for a day when the 5th fell on the Sabbath.